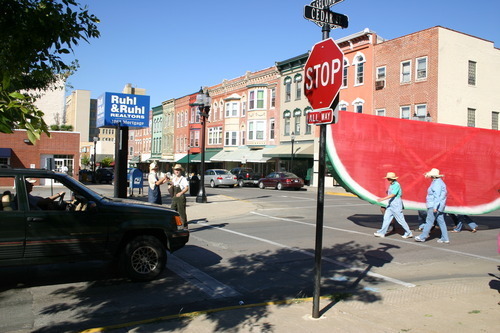 On Saturday, Aug 28, A handful of Muscatine Heroes paraded a Giant 20 foot long water melon down the street to the Muscatine Farmers Market. It was a surprise visit! Yes, that’s right, they didn’t even know we were coming. The looks of awe and delight were golden! The mission started at the corner of Cedar and 3rd street and paraded down the street to arrive, unannounced, at the Farmers Market. People quickly asked who we were and what was going on! 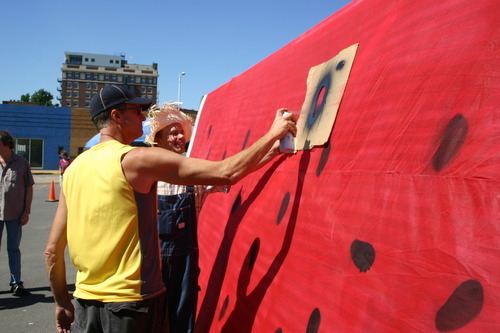 Our answer: Making the Muscatine Farmers Market a fun place to be! The water melon was seedless when we arrived…but not for long. 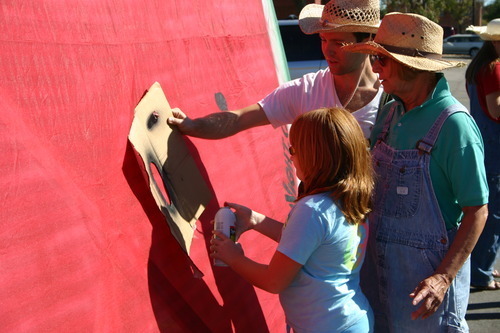 We invited people to paint seeds on! The story started when we (some DoNight artists) were talking about how much we appreciate the local Farmers Markets. Mostly because we’re foodies and love the taste of fresh foods. Wanting to turn people onto the great things found at the market, and reasoning that a fun place is a visited place – we decided to bring the fun – which is something we can deliver by the truck load! 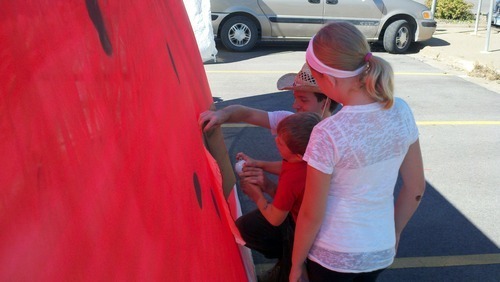 The purpose of the Giant Melon is to make the Muscatine Farmers Market a fun experience. 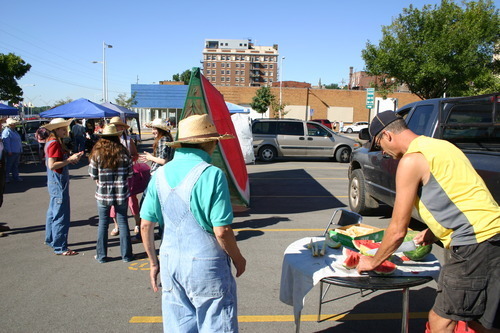 The reason for making the Farmers Market fun is to turn people on to good food. John Kiwala Had freshly sliced water melon and muskmelon ready for us. Thanks to everyone who answered our cryptic secret mission invitation. 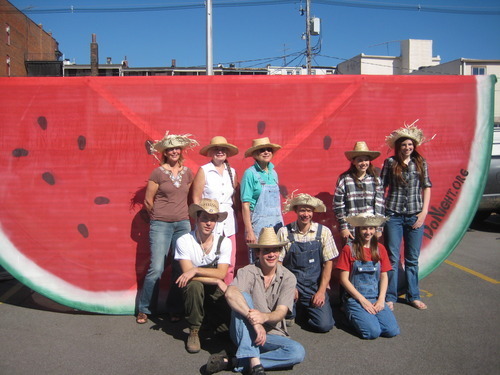 You guys looked great in your straw hats! Thank you Musser Public Library for sponsoring this out of the box event! 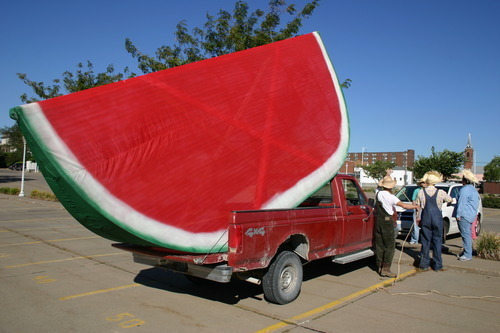 Will you see the Giant Melon again? Hmm, Soon…keep your eyes peeled. Sign up for email updates or connect on facebook to catch news of future spectacles…including invitations to secret missions. Photos in this post are by Kelcey Brackett – Thanks Kelcey! 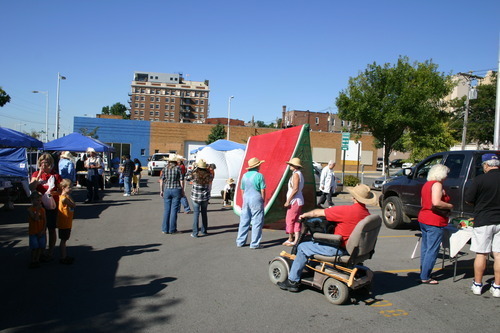 This entry was posted in Events and tagged art spectacle, farmers market, Muscatine, watermelon. Bookmark the permalink. Both comments and trackbacks are currently closed.